Headed the Korean Provisional Government in exile for twenty years. With American backing Rhee was elected first President of Korea, which he ruled with a strong hand for twelve critical years. 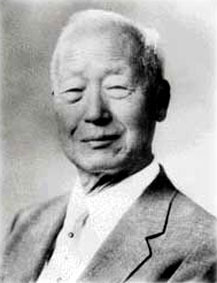 He was forced to resign on 26th April 1960 over the results of the disputed Vice Presidential election, which was fraudulent in favor of Rhee's apparent successor, with 90% of the vote claimed. The National Assembly voted for his resignation, after which the American CIA spirited him away to a life in exile, where he died in 1965.